This blog post shares about what emerged from our meetup, what’s special about this community, and at the end there is a facilitation format that I highly recommend for any new chapter, since it helped us form an organizing community, a plan, and a shared vision. Elixart, an herbal elixir bar in Nevada City, offered to host our meetup there every first Wednesday. It’s a gorgeous non-alcoholic bar and art gallery with a genius menu of drinks and raw food snacks. By the way, they recently opened a new one in San Francisco on Market Street. I haven’t been yet. 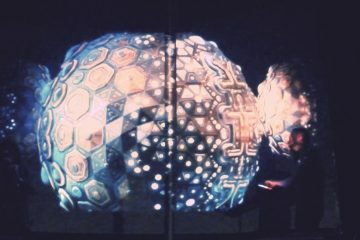 It’s part of an interactive arts and entertainment space (including an augmented reality garden) by OneDome. 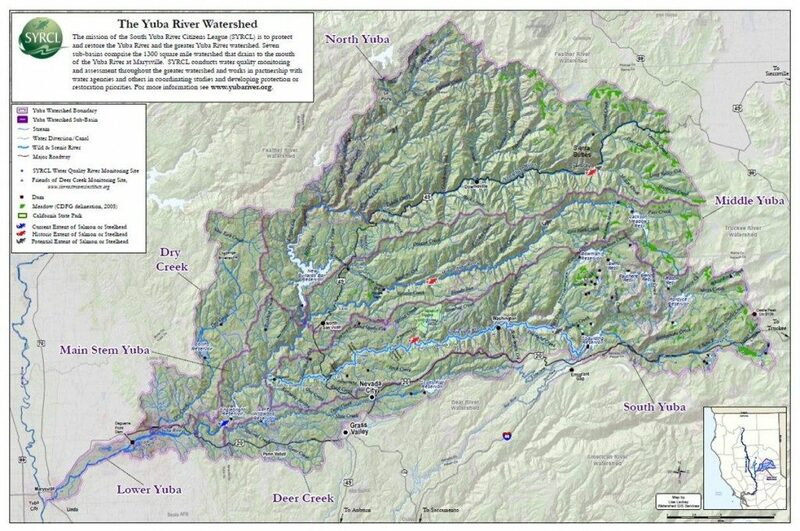 We chose to identify as Bloom Yuba Watershed, since many nearby towns are connected as a larger rural community. The incredibly beautiful and dare I say sentient Yuba River is the center point that binds us together. 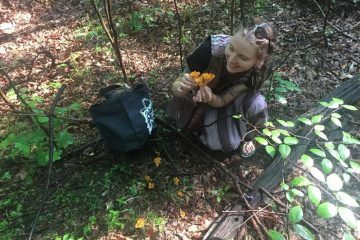 Bloom Network’s community lead, Hannah Mitchell, recommended we encourage local chapters to identify as their bioregion to increase bioregional awareness and organizing. Technically our bioregion is the Sierra, but that encompasses three separate national forests and completely different cultural and production zones. Our first meetup was so powerful. 14 people came, plus the regular night’s bar crowd within earshot. Many people shared that our region has been needing this kind of gathering space and collaboration point for a long time. 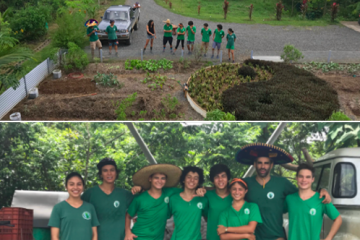 It’s a special community that is like a decentralized ecovillage, with many healers, ethically-focused software engineers, permaculturalists and other visionaries. It tends to be particularly cliquey, with people in small tight-knit friend groups and not a lot of interconnection between them. So, people who have community offerings and small entrepreneur businesses have some difficulty building a clientele base. One participant voiced that the separations are reinforced by law enforcement as marijuana cultivators arrests over the past decades have repeatedly broken trust relationships in our community. I should also mention that our region has a strong radical/conservative split and a fair amount of conflict related to that. We are in the highest risk fire zone in the state, and 45 miles away from the 2018 fire that destroyed the entire town of Paradise. Last summer we were breathing in the fumes of charred cars, buildings, electrical wiring, and humans. The winter before that, flooding temporarily displaced 188,000 people nearby. The First Nations people here are the Nissenan. They are currently working to regain their federal recognition as a reservation. To start our local chapter, I came with only a loose plan of hosting a skillshare and networking each month, with the openness for people to self-organize how we move forward together. The plan for our local chapter unfolded before us right in this first gathering. To summarize, it’s a combination of skillshare & networking meetups, hands-on action coordination, and micro-circles that meet around a specific focus. 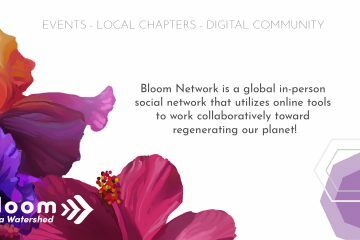 I started with an introduction to Bloom Network, what our local chapters do and how we collaborate internationally through our online network. Our main partner, Yuba Village introduced themselves. More about them in a minute. People asked questions, we meditated to share silent prayer space together, and then we did paired networking to get to know each other. We closed with a circle to share our visions for regenerative culture – during that space our plan emerged. Participants included Bloom’s marketing director, Kristin Johansen of Merkaba Media, Manuel Maqueda of Kumu Innovation Lab, Alli Gallixsee and Thomas Spellman of Yuba Village, a member of Aragon‘s team, an early child development nurse, artists, writers, administrative people, software engineers working on open banking applications and a U.S. watersheds map, and more folks I didn’t have a chance to meet. We had fun getting to know each other and learning about new things. And we got to get high or mellow on the wonderful herbal drinks Elixart has. Yuba Village will be in some ways our main partner organization – they are a continuation of City Repair‘s village-building work, where people engage in place-making projects such as community gardens, public gathering places, and cobb benches (made of earth/clay). These projects are touchpoints for neighborhoods to build together and form a healthy fabric of local connection with each other. Yuba Village did a placemaking festival here two years ago, and they’ll do the second this fall. 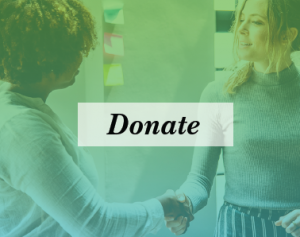 I volunteered to support them with media of their actions, because I want to learn more media production skills, and it will support Bloom Network’s mission of sharing media of local regenerative actions people can participate in to make healthy communities. One woman also suggested that we do a skillshare that wasn’t just one person sharing, but was more people sharing their gifts with each other. That might be the second meetup we do, inviting people to come with their offerings and perhaps doing 30-minute sessions with each other. I could see us doing a business-themed version of that specifically too. When I was researching speed networking facilitation, one practice I came across was of having expert networking rounds, where people who are experts in a topic each sit at a table with up to ten people who ask them questions in an open consultation format, for about 30 minutes and then people move to different tables. At the end of our meetup, a room full of strangers emphatically committed to each other to show up each month and/or for each other on an ongoing basis to build regenerative community. This was asked for so strongly that all I could do was a physical gesture to help anchor us, of getting out of my chair and putting my hand in the center of the circle like a football huddle and inviting folks to do the same, taking a cue from an incredible Rasta man, computer nerd, and solar energy teacher from the Carribean who was there. He offered to help co-organize and tend to the spiritual energy and practical follow through of our Bloom chapter. There is no way I could write what the feeling in the room was like. It was so powerful, so focused, so vision-aligned, positive, and clear. Not only myself but many others have been seeing the need for this kind of anchor point or nexus for our community. 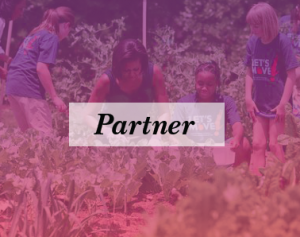 We agree our community has potential to be a model of weathering through climate change and economic disparities, to demonstrate regenerative, healthy, culturally vibrant ways of being together in good relationship with our land and ecosystem. Many people have moved here over the years because of marijuana cultivation, and the economy and lifestyle connected with tending to that medicinal plant has engendered a flowering of skills and wisdom. We want to share all that more deeply with each other and the world. One thing I’m tickled by is that our meetup is at a non-alcoholic herbal bar; one of the bartenders on Wednesday nights is named Indigo, and she is a permaculture teacher! And former co-organizer of Yuba Vilage. The cover graphic we use on our website and print materials is Jessica Perlstein’s illustration of Califia from The Fifth Sacred Thing, a modern witchcraft book that is a parable for transitioning to a healthier society. We’re creating this utopian vision through Bloom Network, in cities around the world. We invite you to play along if you’d like to. One participant recommended I walk into city hall here and ask about local grants funds available for sustainability efforts, to support our local educational organizing and actions. Opening talk introducing Bloom Network, our IRL chapters and online network, mission, programs etc. each person shares their name, their project or passion, and why they’re here at this meetup. 2-4 minutes, with 1-2 minutes for the partner to ask questions. Then switch places. 6-12 minutes total. Repeat with new pairs. 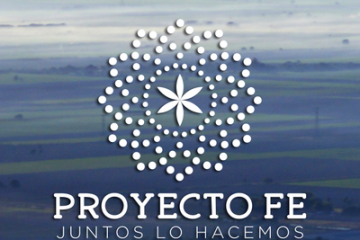 Gather in full circle to popcorn visions for regenerative culture. Note: our group was 14 people total. I’m not sure this part scales with a larger group; you might need to do a few circles if you have a bigger turnout. 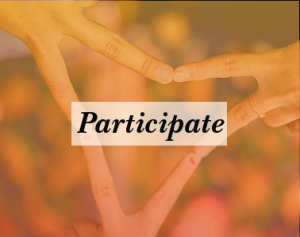 Close with an invitation to commit to continuing to show up to this gathering and for each other. Remind people of when and where the meetup regularly happens. How you’ll stay in touch (email listserv or email list is easiest for now. Bloom Network requests you don’t start a Facebook group, for ethical and effectiveness reasons). Release the circle so people can leave or keep hanging out with each other. I recommend passing a donations basket around or placing it somewhere and pointing it out. Here’s a virtual one if you’ve read this and want to support that way!